The best cordless reciprocating saw plays an important role on the jobsite. The tool makes it easy to cut various materials and objects, including plaster, timber, metal, drywall and more. It is the ideal saw for professionals and DIYers looking for efficiency and speed. The push and pull (reciprocation) action of these tools provides much-needed adaptability and power. The saws are available in a wide variety and each comes with a distinct set of strengths and weaknesses. To make the right right choice, it is vital to consider a number of factors, including weight, stroke length and speed. Reciprocating saws with larger batteries tend to be heavier. Lightweight models are ideal for cutting above shoulder height in relatively shorter runs. Units with a 4Ah 18v li-ion battery provide more grunt and can handle longer run time. On the other hand, speed contributes to more control and better cuts. Variable speed enables you to control the strokes per minute to suit the task. When it comes to stroke length, longer distances covered by the blade translates to faster cuts and extended working life for the blade. The Milwaukee cordless sawzall is one of the fastest tools on the market. It provides significantly longer run time (up to five times more), and thirty percent faster cutting. Some of the key features offered by the brand include a gear protecting clutch, built-in LED light, brushless motor and blade changes that do not involve the use of any tools. The saws are shipped with powerful batteries and a charger. The LED lights are designed to illuminate the cutting and blade area. It also features a large hook and blade brake. The adjustable shoe makes it easy to set the required depth. The Makita saw comes with anti-vibration technology and delivers awesome power. It has the capacity to achieve smooth cuts. Its anti-vibration technology employs a counter balancing system to improve efficiency. The tool maintains constant speed using its 15-AMP motor electronic speed control mechanism. It also boasts a one and a quarter inch stroke, which can reach 2,800 strokes per minute. On the other hand, its clutch system is designed to extend the working life of the saw by stretching out the motor and gear in the event that the blade binds. 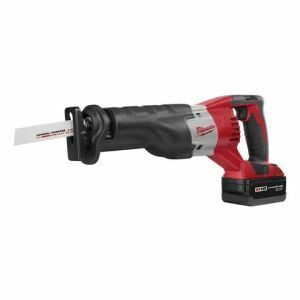 This cordless reciprocating saw can handle wide-ranging tasks, including remodeling, demolition, drywall cutting, woodcutting, plaster and more. The Dewalt cordless reciprocating saw provides exceptional performance for a variety of tasks. It is well suited for use in confined spaces thanks to its ergonomic and lightweight design. The tool makes it easy to work in cabinets and between studs. 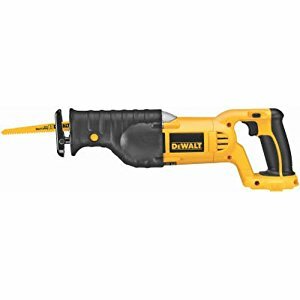 The DeWalt saw also features an adjustable blade clamp that allows you to handle flush cutting with ease. Meanwhile, the clam is designed to simplify blade changes, which can be carried out in a matter of minutes. The tool can light up the cutting area using LED lights. This enables you to work in dark areas, such as ceilings and unlit basements. 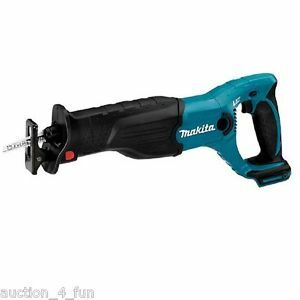 The Makita cordless reciproction saw is undoubtedly the best model available on the market. It is a dependable tool that is suitable for both professionals and DIYers. The sawzall comes with thick, textured rubber nose cover and high-impact plastic body. This allows the saw to last longer regardless of the tasks it handles on a regularly basis. Heavier units are great for withstanding the blade’s rapid back and forth motion. The Makita saw offers optimal run time for your projects.